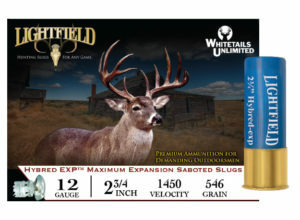 Slug gun hunters know the devastating combination of accuracy and knockdown power afforded by Lightfield’s proven Hybred line of shotgun hunting slugs. 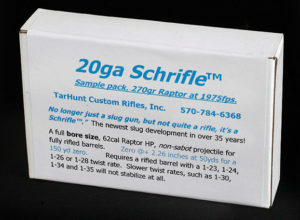 For 2015, Lightfield offers discriminating slug gun hunters a new premium 12-gauge round that combines the proven IDS design with a lighter, faster, 465-grain pure lead slug that shoots flatter than a Kansas parking lot. SKU: LBB-12. Categories: Ammo, Lightfield Hunting. 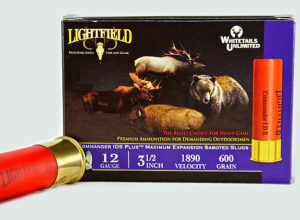 Like all Lightfield slugs, the new Lightfield Bucks, Boars & Bears (LBBB-12) 2-3/4” 12-gauge slug is designed to chamber to any barrel, ensuring consistent performance in both rifled and smooth bore shotguns. The speedy LBBB-12 leaves the muzzle at an impressive 1,600 fps with a massive 2,643 ft-lbs of energy, before delivering a staggering 1,094 ft-lbs into its target at 125 yards with a mere ¾” of drop. 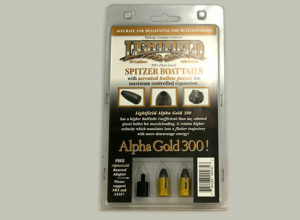 Bear hunters, too, will quickly come to appreciate the merits of the new Lightfield LBBB-12. Its impact-discarding sabot design helps control the expansion of the slug upon impact, boring through hide, tough tissue and bone to penetrate deeply where full expansion then occurs.